In 1979, then-President Jimmy Carter announced the installation of solar panels on the White House roof. 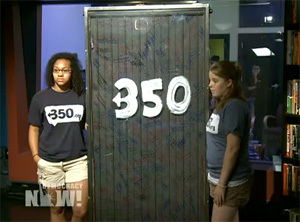 Today, a group of students from Unity College in Unity, Maine, accompanied by 350.org  founder and environmentalist Bill McKibben, will ask President Obama to re-install the panels on the roof of his home. The story of how the solar panels got from the White House to Maine was covered yesterday morning on Democracy Now! as the student delegation passed through New York on its way to Washington, D.C. Democracy Now!, broadcast on WPFW every morning in the D.C. metro area, is the always-informative, often-disturbing, independent- and grassroots-focused news and interview program hosted by Amy Goodman. Yesterday, Goodman and co-host Juan Gonzalez covered a story that provided both a reminder of the importance of symbolic activism and insight into how the next generation of activists is being born. Granted, as Bill McKibben commented, delivering solar panels to the White House is a symbol far short of comprehensive climate-change legislation, which is what's needed as a start from Capitol Hill. But the whole trip -- from the media publicity, to student leader Jean Altomare's vocational conversion -- is concrete action as well. In McKibben's words, since the legislation isn't likely to happen anytime soon, at least "the Republicans can't filibuster the roof." Listen to the full story at DemocracyNow.org . Warning: Symbol and action might cause conversion. Karen Lattea is chief administrative officer of Sojourners.